Condominiums are becoming more attractive to retiring baby boomers, return-to-urban dwellers, as well as the second home/vacation home and condo/hotel market. Though some can be as big as and amenity filled as the country homes that have been left behind, most are not. And what about the always in view condominium kitchen? Is there a better solution? We think so. The smaller condos demand a change in lifestyle. Storage is always lacking. Bathrooms never have windows. Open plan design negatively affects noise and privacy issues. Rigid layouts reduce creative opportunities. Perhaps it is time to step back and take a second look at how these smaller condos are planned. In this article we hope to show how installing Kitchen Workstation Furniture (KWF) instead of using built-in cabinetry can make a huge difference in almost any condominium kitchen! The image above shows a view from the entry. Many one bedroom (800 to 1000 sq. ft.) and two bedroom (1200 to 1500 sq. ft.) multi-story Condominiums have common characteristics concerning the kitchen. The living and dining areas are combined together. Most of the time, the kitchen is also exposed to these living areas. 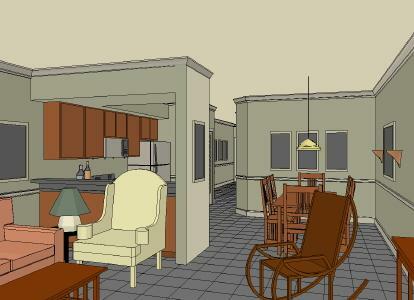 These living areas are the only living area in the unit; there are no family rooms or dens. Due to the exposed kitchen, the open plan layout is usually quite informal, more like the kitchen/family room in full sized homes. The kitchen is almost always next to the front door. 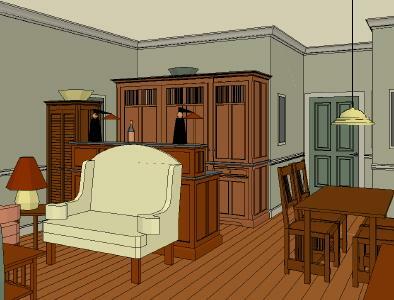 Many times, visitors must walk through the kitchen to get to the other living areas. When the kitchen is not being used, it still looks like a kitchen, as viewed from the other living areas that are ‘furnished’. Personalization occurs in the ‘furnished areas’ not in the built-in kitchen where all wall surfaces are covered with cabinetry. The kitchen has one color of cabinetry, counter tops and exposed appliances. Blending it with the décor of the adjacent areas is a challenge, especially for the second owner who did not have the opportunity to select the colors. Double Loaded, interior access corridor condos (DL) have squarer and less deep floor plans than the Single Loaded, exterior access corridor condos (SL). Entering the front door of a SL condo, one must usually walk down a narrow hallway, into or directly past the kitchen to get to the living area. The DL condo’s front door is normally right next to the kitchen. In both models, the kitchen is the first thing that is seen by a visitor. This 945 sq. ft. DL condo features a typical U-shaped kitchen. 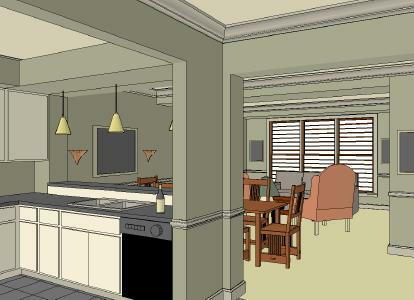 Here, the walls, soffits and a different floor surface separate the Kitchen/ Entry area from the Dining/Living areas. Let’s make one point very clear. Here at YesterTec, we are not saying that this type of design is wrong. Its just that since people are so accustomed to seeing kitchens designed this way, they think that this way is the only way! Here is the same unit, shown with KWF. The separating wing walls and soffits are simplified. The varying heights, colors and shapes of the workstations are possible only because the wall, floor and ceiling colors unify the entire unit. 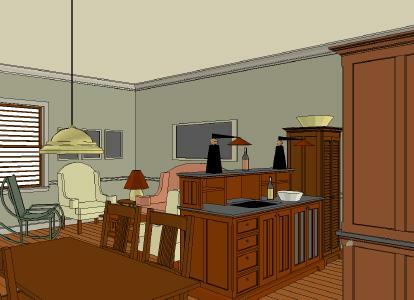 The workstations look like real furniture because all the hi-tec appliances are concealed. The Armoire against the wall on the right includes the refrigerator and a full height dry storage pantry. The range breakfront conceals the oven and microwave and the island sink workstation conceals the dishwasher. 2 smaller pieces flank the sink workstation, adding utility and diversity to the kitchen without competing with the major pieces. This kitchen (in the same sized unit) is more open to the dining area than the others and features a refrigerator piece and a Working Pantry separated by a green infill storage piece. The Working Pantry features a concealed countertop that hides all the small appliances like the toaster, blender and food processor, plus lots of storage. This kitchen is smaller but just as efficient as the other kitchens, leaving more space for the Dining/Living area. The large armoire conceals the oven, microwave, refrigerator and full height food storage pantry. The island contains the downdraft cooktop, a sink and concealed dishwasher. This is a 953 sq. ft. Single Loaded condo with a built-in kitchen. The front door is located down the hallway on the left. 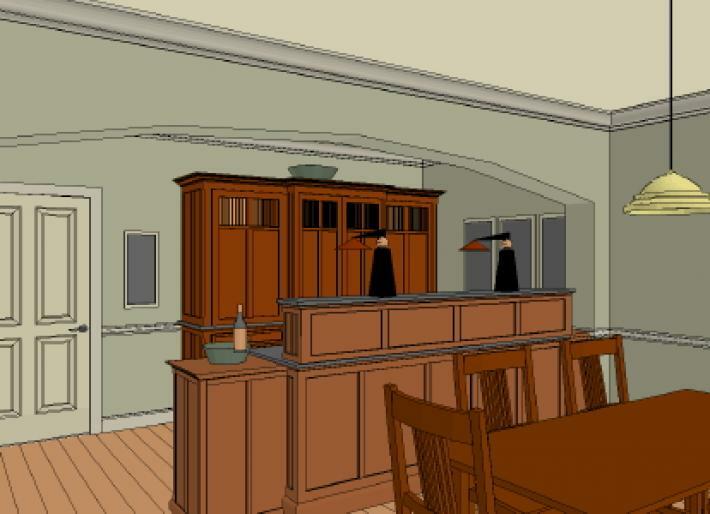 The informal quality of this design is defined by the color and texture of the cabinetry. 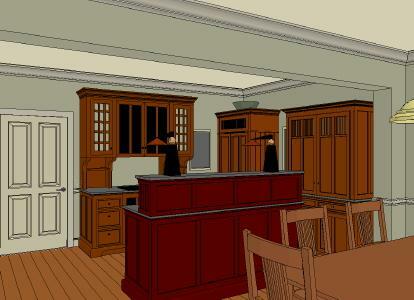 Heirloom quality furniture will visually clash with this kitchen, since the hi-tech appliances are always exposed. Here is the same condo, shown with KWF. The ‘kitcheny’ look is all but gone. Can you see it? 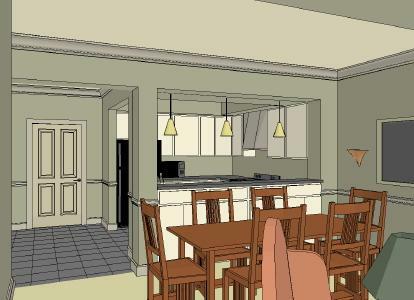 The kitchen and dining area are integrated in one area. The sculptural formality of the individual super-efficient pieces allows the whole apartment to have a more formal look, one that blends in well with family heirlooms. All three of the workstations are more efficient than typical two foot deep cabinetry. Their deeper counter tops yield more undercounter storage, and the full height storage pantries flanking the concealed refrigerator have more accessible storage space than typical top cabinets. 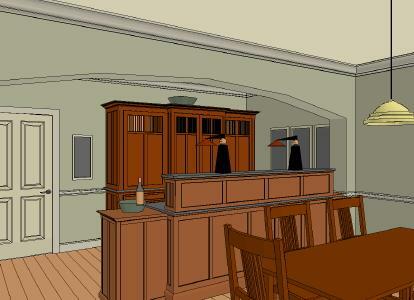 Here is a design for another DL condo that takes the place of an 8′-6″ x 8′-6″ U-shaped kitchen. The range and refrigerator are concealed in one, integrated armoire. Instead of upper cabinets, the Hi-boy next to the island sink provides more accessible storage. The storage unit above the island sink shields the living room from the view of the messy counter tops. Now, when the kitchen is not being used, it does not have the techy look of a normally exposed kitchen. Can you see the difference? 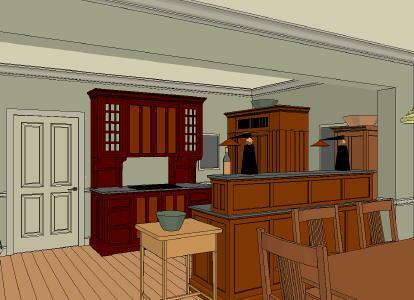 Can you imagine how KWF would change your next kitchen project? There are very few open-plan designs that can’t be designed with KWF. And if our 250 models aren’t enough, our furniture can be combined with other built-ins, cabinetry and/or pieces of furniture. So call us and let us help you find the plan that is just right for you. 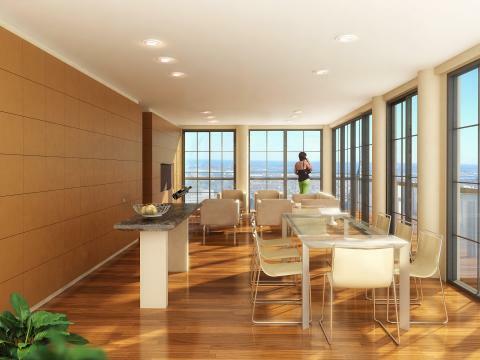 The image above highlights a condominium kitchen with a minimalist design theme. The kitchen is completely hidden by doors and drawers that resemble elegant wall panels, utilizing YesterTec’s Stealth Kitchen Modules. The modules safely hide all the appliances, sink, counter tops and storage systems. This full-sized kitchen includes a 30″ oven, 30″ cooktop, 30″ microwave hood, 21″ sink, 24″ dishwasher, a 700 TCI Subzero refrigerator/freezer, counter tops and storage areas. The freestanding table functions as a sculptural piece of furniture that can also be used for food prep or buffet space. 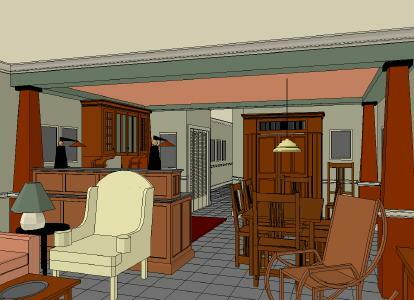 Note: The above images were modeled with our 3-D CAD design program. All of our workstations have many available styling options, but only a few of these options can be modeled in the images. To create each workstation, our designer’s catalog that graphically shows all the available options is required.